There are as many reasons for Spider-Man: Into the Spider-Verse to have won the Best Animated Feature Oscar as there are alternate universes and Spider-People. 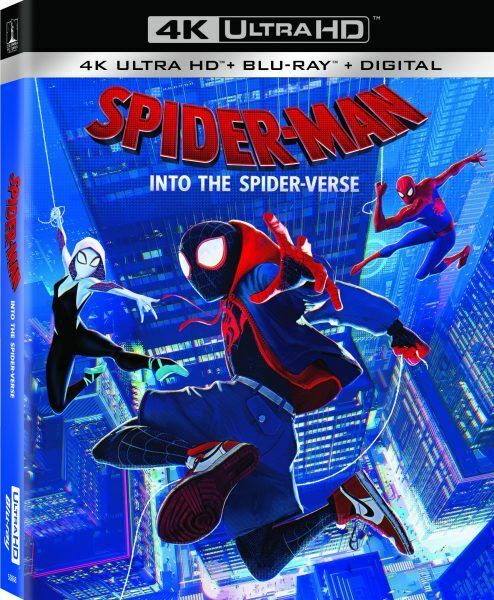 If you happened to miss Sony Animation’s visually stunning and character rich superhero flick in theaters, you’re in luck because it’s now available on Digital, DVD, Blu-ray, and 4K release. 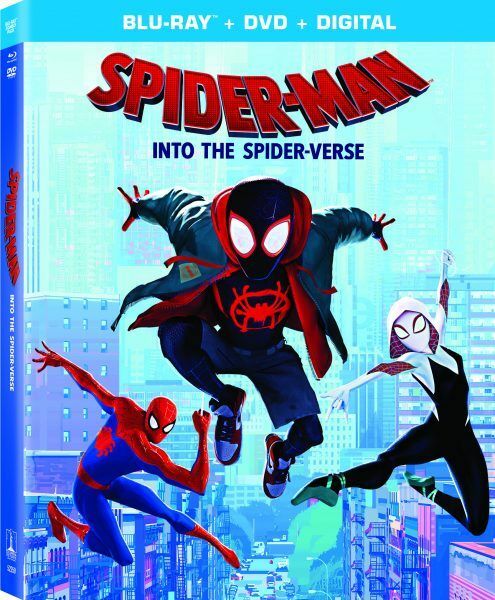 And while the award-winning and infinitely rewatchable feature is more than worthy enough of a purchase on its own, this home release is full of rewarding looks at the Spider-Verse’s many characters, the history of Miles Morales & Friends in Marvel Comics, a starting guide to Easter egg hunting, a tribute to the late, great Stan Lee and much more. With that in mind, we’ve included everything we learned from the Spider-Man: Into the Spider-Verse Blu-ray below. This includes trivia from the filmmakers commentary and the included Alternate Universe viewing mode, which folds in animatics and “deleted scenes” that offer a whole new angle on the Spider-Verse story; for example, an early draft of the plot included Miles’ best friend/roommate Ganke Lee learning about his superpowers and helping him figure out how to use them by watching a documentary on Spider-Man. (Additionally, I learned that filmmakers Phil Lord and Chris Miller always sneak a dolphin and dolphin call into their projects; Spider-Verse is no exception.) Even the Blu-ray cover itself has a fun surprise for fans once they unsleeve it to get at the Blu-ray goodness inside! Co-writer/producer Phil Lord, producer Chris Miller, co-directors Bob Persichetti and Peter Ramsey, and co-director/co-writer Rodney Rothman. The opening credits, which are pulled from various Marvel universes, includes a sticker from Miles and a Columbia Pictures logo from the studio’s 1965 movie Cat Ballou. The 42 on the pingpong ball is a reference to Miles’ origin story, in which he won a lottery to attend the Visions Academy. It was also Jackie Robinson’s jersey number, which is why Brian Michael Bendis chose it. There was some early resistance to the Spider-Man dance joke, but Rothman pushed for it and the audiences responded so well to it. They pay special attention to “chromatic aberration/color separation” to add a depth of field to every frame and give it a sort of 3D quality, though it comes from a printing technique. There’s some foreshadowing early on: In the classroom that Miles is late to, Dr. Olivia Octavius is seen on the filmstrip that’s playing, though her full name is obscured. There’s also a cover of “Great Expectations” in which the criminal Magwitch touches the shoulder of the young and impressionable Pip. Oh and there’s a rice cooker in Miles’ dormitory because of his roommate Ganke’s Korean-American heritage. Miles’ expression when he’s caught trying to fail his way out of school was borrowed from Barack Obama. There’s a quick Donald Glover Spider-Man Easter egg in Aaron’s apartment. There’s a special call-out to production designer Justin Thompson who’s knowledge of comics and hard work were essential to pulling off the look of the movie. All of the producing/filmmaking team are featured on the front and back cover of the Spider-Man comic that Miles reads in his dorm after coming to terms with his powers. “Ultimate Spider-Man” writer Brian Michael Bendis and artist Sara Pichelli are also in Miles’ contact list on his phone. The giant Green Goblin comes from Miles’ universe, the Ultimate universe. Miles’ Air Jordans were a gift from Uncle Aaron. The collider’s particle beams are created through both “Kirby dots” from Jack Kirby’s artistic style, but also look like paint from a spraypaint can. Because every animator wanted a chance to animate Stan Lee, every time a train goes by in this movie, you’ll see him riding as a passenger. All of the drawings around Peter Parker’s tombstone were actually done by the kids of people who worked on the movie. Chris Miller has a voice cameo as the police dispatch officer during the chase scene through New York City. Stan Lee also walks over Miles and Peter in the crosswalk. In Dr. Octavius’ lab, everything in the design is octagonal. They also tease the possibility of Doc Ock getting to do more after this movie, if only for Kathryn Hahn to get to enjoy the spotlight a bit. There’s a quick shot of Gwen Stacy in the facility while Peter and Miles are escaping from Doc Ock. There’s another special call-out for art directors Patrick O’Keefe and Dean Gordon with regards to the design of the forest and Alchemex. The Peter Parker in Spider-Gwen’s universe was jealous of her spider-powers and became a villain, as hinted at in her origin sequence in this movie. Spider-Gwen also hits a time anomaly during her trip to Miles’ universe, so she actually staged their meet-cute after spider-vibing with him at school. All the spider-suits in the background of the underground bunker at Aunt May’s place are real suits from the franchise. Spider-Ham’s world is inspired by “Pigs Is Pigs”, a Disney short adapted from Ellis Parker Butler’s 1905 short story, which was animated in the flat and colorful style of the UPA animation studio. Composer Daniel Pemberton is often cited throughout the commentary. The Prowler’s theme is actually a modified elephant sound. It’s easy to miss, but Peni Parker is wearing skate/roller shoes. After the death of Miles’ Uncle, Spider-Ham’s line was originally, “My Uncle Frankfurter was electrocuted; he smelled delicious.” The line always got a laugh but it ruined the mood of the scene and made the character one-dimensional. The filmmakers address the speediness of Miles’ custom Spider-suit. The idea for Kingpin to use the collider to bring back his deceased wife and child came from Brian Michael Bendis a few years before it made its way into a Miles comic. There’s a special call-out to the editing team, including Vivek ‘Vic’ Sharma, Andrew Leviton, and Robert Fisher Jr. The commentary team says that their rendering tasks nearly broke Imageworks’ server farm. There’s a version of the final fight sequence that’s even crazier than the one that’s in the final version. In the train, there are multiple versions of its interior from the various universes, like Peni’s world and Spider-Noir’s world; you can catch glimpses of these as they flash by. It was Irina Cuadra who suggested that Miles do the “shoulder touch” to kick off the Kingpin finisher in the final fight sequence. The Cloudy with a Chance of Meatballs food machine, the FLDSMDFR, can be glimpsed in the particle accelerator explosion. Jorma voices Spider-Man 68. Greta is Lyla. Oscar is Miguel. Stars Shameik Moore, Mahershala Ali, Luna Lauren Velez, and Hailee Steinfeld, and Kimiko Glenn, producers Avi Arad and Christina Steinberg, co-directors Peter Ramsey and Bob Persichetti, production designer Justin K. Thompson, writer/producer Phil Lord and writer Chris Miller, and head of story Paul Watling talk about the heritage of Miles Morales and his family in Brooklyn, how Miles deals with the newly inherited superpowers. Lord and Miller reveal that Shameik wrote his dreams in his journal: “I am Miles Morales” was written on one side and “I am Spider-Man” was written on the other, years before this movie. The movie was animated on twos, meaning there were half as many frames per scene than usual, giving it a crisp, motion-comic like look. More comic book similarities include splitting certain scenes and sequences into multiple frames focusing on different things and using text blocks to communicate various messages, like battle impacts and texts. We get shots of Jake Johnson, John Mulaney, Live Schreiber, Shameik Moore, Hailee Steinfeld, Kathryn Hahn, Bryan Tyree Henry, Luna Lauren Velez, Mahershala Ali, and Nicolas Cage. Ramsey says they let the actors just run wild with the dialogue because that’s why they brought them in for the role. Turns out that Live Schreiber jammed toilet paper up his nose to make him sound bigger and “tougher”, according to Schreiber. The addition of a female Doc Ock came relatively late in the game. Great homage to the late, great Stan Lee, featuring the man, the myth, the legend himself talking about how excited he always was to talk to fans about Spider-Man. The cast and crew get to pay their own special respects to Lee and Steve Ditko here. There’s a history of Marvel Comics here as well, including a special guest appearance by writer Brian Michael Bendis, artist Rico Renzi, and artist/Spider-Gwen co-creator Robbi Rodriguez. 42 is the number the Miles won the school lottery with, but it’s also Jackie Robinson’s jersey number. Dante’s shirt has a pug on it that was based on the real-life dog of one of the movie’s character designers, Peter Chan. Sara Pichelli and Brian Michael Bendis created Miles Morales in the Ultimate Universe; Pichelli did a special Ultimate Universe cover for the comic in which Miles wears the movie costume. There’s a quick shot of Donald Glover dressed as Spider-Man from Community on the TV in Uncle Aaron’s apartment. Persichetti’s family members Leo, Luca, and Fifi all have their names in graffiti. In the back of the Spider-Man comic, there’s an ad for a pyramid scheme that features likenesses of a bunch of people who worked on the movie; Persichetti’s on the cover being apprehended by Spider-Man. When Kingpin is watching the Collider open various dimensional portal, the numbers on a map for said dimensions correspond to the comics universe. Stan Lee’s most obvious cameo is at Stan’s shop where he sells Spider-Man masks, but he also crosses the crosswalk where Miles and Peter crash, and often rides on the train as a passenger. In every piece of media that Lord & Miller do, there’s always a dolphin and a dolphin sound. There’s a dolphin that gets pulled into the universe, just for this purpose. The Kingpin Family montage scene was inspired by artist Bill Sienkiewicz. On the Columbia logo in the opening credits, there’s a woman firing two six-shooters; that’s from the film Cat Ballou, a favorite of Lord & Miller’s. Spider-Man’s dune buggy comes from 70s-era comics where the character actually had one; he held onto it all these years. In the Spider-Lair, all of the costumes are references to real outfits seen throughout the franchise’s history, including the recent PS4 game. Other things hidden in the lair include a photo of Stan Lee (He did say they were friends.) and a photo of Spider-Man (in a black suit and tie) with Barack Obama. The food-making machine from Cloudy with a Chance of Meatballs can be seen here as well, as mentioned in the commentary. Two of the guests at the fancy dinner are avatars of VFX supervisor Danny Dimian and head of character animation Josh Beveridge. The movie “is dense with hundreds of them”, but Lord & Miller don’t know exactly how many there are; won’t you help them out? Starting with the art department and their concept art, the test moves to lighting key art where the filmmakers discovered lots of cool things they didn’t expect, like the contrast of styles of various Spider-people against each other. You get to see animation references (live-action shots paired with their animated scenes) and hear all about figuring out just how fat and slow the older Peter Parker was going to be. Peni and SP-DR were inspired by anime, so the team went back to the original inspiration in order to design the character for the movie. Initially, the SP-DR robot was more of a tank, but the team wanted it to look more “believable” but also have a range of emotions. Spider-Man Noir’s character has simpler shading in addition to the black and white. His fighting style is more of a Victorian-era boxing and brawling. Spider-Ham was the “silver bullet” for the filmmakers in the movie despite the fact that there was some hesitation at the beginning. His inspiration is from 1940s and 1950s animation and classics like Chuck Jones and Tex Avery. Gwen was made “less perfect” by having a gap in her teeth and a slight bump in her nose. Miles, on the other hand, jus got his powers so he’s clumsy. One of the biggest storypoints is when Miles gets to make his own suit; that’s when he finally embraces his own style and his own powers. Doc Ock gets a gender switch and soft-armed, pneumatic tentacles this time around. Alfred Molina’s take on the character was referenced along with Doc Ock fights in the comics. Don’t forget about Green Goblin! This version is the Ultimate Universe’s take on Norman Osborne, but even bigger. Tombstone, too! He has a striking, severe look as the right-hand man for Kingpin. Scorpion arrives as well, though in the big battle at the end. The design of the legs that pop out came about during the concept art process, but they liked this unique version of the character. Stick with it, the first alternate animatic arrives well after Miles’ day at Visions Academy. The first alt scene is a dinner scene with Miles and his parents where he tells them he’s leaving the academy to return to his more familiar school. The message is pretty much the same but it plays out a little differently and features more screentime for Miles’ mom, Rio Morales. There’s an alt take of Miles leaving his uncle after a night spraypainting the old subway tunnels. He gets a text from Ganke to hang out. While they listen to music, the genetically enhanced spider makes its way out of Miles’ bag and almost bites Ganke. They bat it back and forth between them, but it ultimately bites Miles. A quick alt animatic of Miles’ nightmare after being bitten and his freakout upon waking up. Another alt take sees Miles escaping the security guard and making it to his room where he starts to figure out his spider-powers. Ganke enters and immediately sees him clinging to the ceiling. After 3 hours, Ganke helps Miles off the ceiling, or tries to at least. Ganke then inspects Miles’ spider bite and puts two and two together to convince him that he’s the new Spider-Man. (There’s a nice reminder that Spider-Man’s web-shooters are traditionally mechanical.) They then sneak into the library at night and watch Columbia Pictures Presents Will Gluck’s ‘Spider-Man: The Motion Picture” starring Todd Crews in the title role. Gluck delivers the commentary track with special guest, “the actual Spider-Man.” The whole point is that Ganke wanted to show Miles the “real-life adaptation” in order to see how to handle Spider-Man’s powers, like his wall-crawling ability. Miles takes pictures of the spider that bit him in order to trace the critter back to its source. Miles freaks out on Ganke because he doesn’t want to be Spider-Man right now. After Miles’ run-in with Spider-Man, who dies at the hands of the Kingpin and the Prowler, there’s another alternate animatic showing how the particle accelerator could have created a black hole and a window to multiple worlds, but it’s unclear whether it’s Miles’ nightmare or something that’s actually happening. Soon after that, there’s another alternate scene showing Fisk giving a speech at Spider-Man’s memorial, along with a short CG-animation of Miles retreating through the crowd. It cuts to a scene of Miles and Ganke watching the Will Gluck film to learn how to figure out Miles’ new powers, followed by a montage of Miles trying to do just that. From wall-crawling, to leaping from tall buildings, to getting a costume that fits, it’s a pretty funny sequence. While the movie version of the hero is getting accolades and performing heroics, Miles is getting laughed at and failing miserably. It all connects back together once Miles falls and busts the USB drive that will override the particle accelerator. When the alt version of Peter Parker crash lands in Miles’ universe, he arrives without any pants at all, leading to him getting arrested by the cops. It’s how he learns that this universe’s Peter Parker, now revealed as Spider-Man, died and his funeral is the next day. There’s an extended animatic where the other universe’s Peter Parker explains a bit more about the multiverse and the particle accelerator explosion over burgers and fries, followed by the two of them hoping a plane at JFK. On the plane, in a much larger-than-usual airplane restroom, Parker shares the secrets of his superhero life with Miles. Most of them involve bringing plenty of baby powder, aspirin, and Ben-Gay any time he goes out to fight crime. Some really funny stuff from Johnson and Moore here. During the escape from Doc Ock, Peter and Miles land on a beach at the edge of the forest (amidst a gathering of sea lions) and are saved by Spider-Gwen/Gwen Stacy/Spider-Woman. This is pretty much the same except for the location where they first meet. Following Gwen’s alt arrival, there’s a quick sequence with the three of them where Gwen and Peter tell Miles to expect infinite Spider-people. Back at Aaron’s apartment, Jefferson shows up to ask if he’s seen Miles and what his brother’s been up to for work these days. Aaron also gets a pizza delivery. Peter and Miles have a heart-to-heart conversation. This one actually went pretty far into development because the character animations are almost finished, a rare occurrence for animated movies. There’s a lot of really good dialogue here from Johnson and Moore but ultimately it was likely cut due to time and pacing. There’s a funny series of deleted animatics during the fight inside Aunt May’s house. One features SP//dr crashing through the ceiling and a toilet landing on the robot’s head, another sees the fight spill outside from a neighbor’s perspective as she drives by, plus plenty of shots of the absolute chaos happening in the fight. During Miles’ montage where he’s made his super-suit and starts to believe in himself, he crashes through a tractor-trailer. In this animatic, he comes to a rolling stop on the sidewalk before picking himself up and swinging away again. A quick animatic shows the trio of Spider-Man, Spider-Gwen, and Spider-Noir wheeling the cart of food into the kitchen where Tombstone is waiting. A naked Spider-Ham, with an apple in his mouth, is laid out on the serving platter. Another quick sequence shows the Spider-team breaking into Kingpin’s estate and secret underground facility. Another animatic sees Doc Ock gazing into the multiverse portal. She says, “The power of the multiverse, in the palm of my hand,” before diving into the heart of it. A quick animatic shows Miles saving Jefferson Davis in the resulting explosion. Lord and Miller return during the end credits to remind you to keep looking throughout the Blu-ray for all the extras it has to offer. A delightful short cartoon that harkens back to classics like Looney Tunes, Merrie Melodies, and even series like The Powerpuff Girls. For a little extra hammy goodness, this toon hits the spot. The multiverse’s Kirby dots take over the animation of Spider-Ham and reveal the tablet and pen used to draw him and his environment. It also shows what happened just before Spider-Ham was pulled into Miles’ universe.